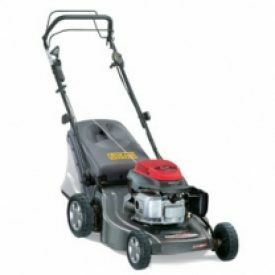 The Castelgarden Xa53hv lawnmower is also an extremely versatile machine as it offers a 3 in 1 system for cutting your grass. Firstly, it comes with a rear discharge system which simply allows the grass to fall to the ground when cut. Secondly, its collection facility features an impressive grassbag capacity of 70 litres. Finally, it also offers the added facility of recycling your grass through the use of its mulching kit. Mulching is generally regarded as the most efficient and effective method of cutting your grass. It cuts and recuts the grass into tiny pieces. These, in turn, simply wilt away returning vital nutrients to the soil thus encouraging beautiful, green growth. 4 speeds allows you to cut the lawn at your own pace with perfect results.